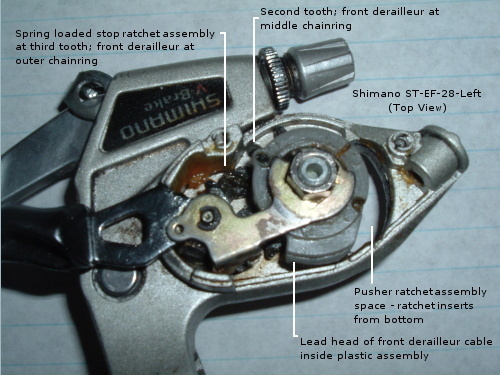 It's proved challenging to locate an exploded diagram of the older Shimano ST-EF28 combined front derailleur and brake assembly—disassembly is the next best thing. A common and easily fixed problem with the Shimano ST-EF28 is that the bolt holding the pusher ratchet assembly (i.e. the lever your thumb pushes) loosens, causing the pusher ratchet to slip off its tooth1 when tension is applied to the cable (i.e. shifting to the middle or outer chainring). It appears that the four tabs on the tab-washer when sufficiently bent inward are intended to prevent bolt loosening. 1. There are two sets of ratchet teeth—bigger stop ratchet teeth and smaller pusher ratchet teeth. The bigger stop ratchet teeth are easily seen in the top image. The smaller push ratchet teeth are masked by the plastic cable holder, but are easily seen after removal of the pusher ratchet assembly (i.e. 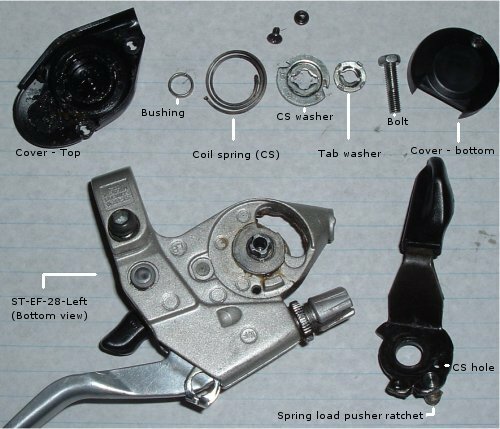 remove bottom cover, bolt, tab washer, CS washer, coil spring, bushing, and pusher ratchet assembly).